I’m changing things up a bit this month as something has come along that is just too good to pass up. I’ve had a very special opportunity that I’d like to pass on to you. 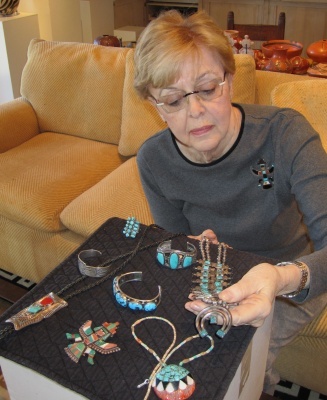 Specifically, I’ve been asked to appraise and sell the fine antique American Indian jewelry collection of a client. The estate executors have asked me to price the pieces in the collection quite attractively, so I’m able to offer you these jewelry items at some very low prices. In fact, I’ve been authorized to offer each of these jewelry items at a full 1/3 off of the realistic market value. If this offer is attractive to our viewers, we may be able to offer additional jewelry from this estate later on. Do not let the low jewelry prices fool you – this is actually a very good collection of antique American Indian jewelry with some especially great pieces. There is really a little bit of everything a collector could want here from a multi-strand coral necklace with jaclas to a Puebloan natural turquoise tab necklace and everything in between including a superb Zuni inlay set, an old trader’s turquoise bracelet, a fine box bow squash blossom necklace, a silver link belt, handmade silver beads, and an array of lovely rings. The work of some prominent Native American artists is even represented in the collection. There are several pieces by Dan Simplicio, a Frank Vacit pin/pendant combination, a Julian Lovato ring, and a Ike Wilson bracelet. As you can tell, I’m quite excited that I have the chance to sell this collection of American Indian jewelry. I hope that you find something in it that pleases you. 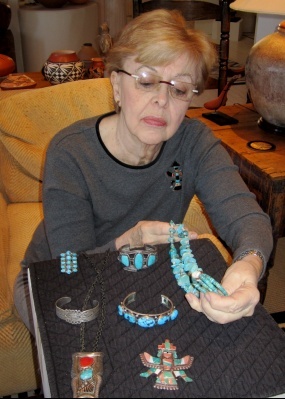 Watch videos of Marti Struever discussing estate sale jewelry, Marti Struever with estate sale rings, or Marti Struever with estate sale bracelets.